I woke up last Tuesday, my throat ablaze with scratchy, swollen soreness, and when I opened my mouth to respond to breakfast requests from my kids–there was nothing but squeaky attempts at language. I pushed out the word, “Breakfast?” and then handed around the cereal bowls as requested. Thus ended our morning conversation. This was a problem. Having only finished one night of our five-night long Vacation Bible School, I had a week of speaking and singing ahead of me. A week of object lessons and praise songs. A week of yelling out our Bible point for each night and a week of rallying excitement among the kids. I gargled and drank tea. I used throat spray and became a chain sucker of cough drops. I drank enough water to float away and faithfully popped vitamins every night. But my chief strategy became rest. All day, every day I didn’t speak. If necessary, I whispered, but mostly I was a silent member of my household. A week as one of the voiceless got me thinking about what we say and how we say it, how our words reflect our heart, how we’re called to be listeners, and more. By the end of each hushed day last week, I stepped onto the stage at church and spoke the first full-voiced words in about 24 hours. “Welcome to VBS! We’re so glad you’re here tonight . . . ” My only normal vocalizations each day were lessons about God’s Word to children. I wonder, at the end of a normal day when my voice is unrestricted and I can chatter on at will, what is it that I’ve been talking about? Praising God and sharing from His Word? What about you? How do you put your voice to use each day? Out of necessity last week, the only way I could really use my voice was talking about God. The moment that Vacation Bible School ended and I climbed into the minivan with my kids, I returned to a life of silent listening and, if necessary, whispered prompts to get others talking. Words have power and impact. They can build others up, fill their spirit with strength and courage, and point them to Christ. But words can also rip people apart, tearing their spirits down to tiny shreds of defeated nothingness. Indeed, “death and life are in the power of the tongue, and those who love it will eat its fruits” (Proverbs 18:21 ESV). With such weaponry in our arsenal, with such power housed in a simple voicebox, you would think we’d be more cautious about what we say. 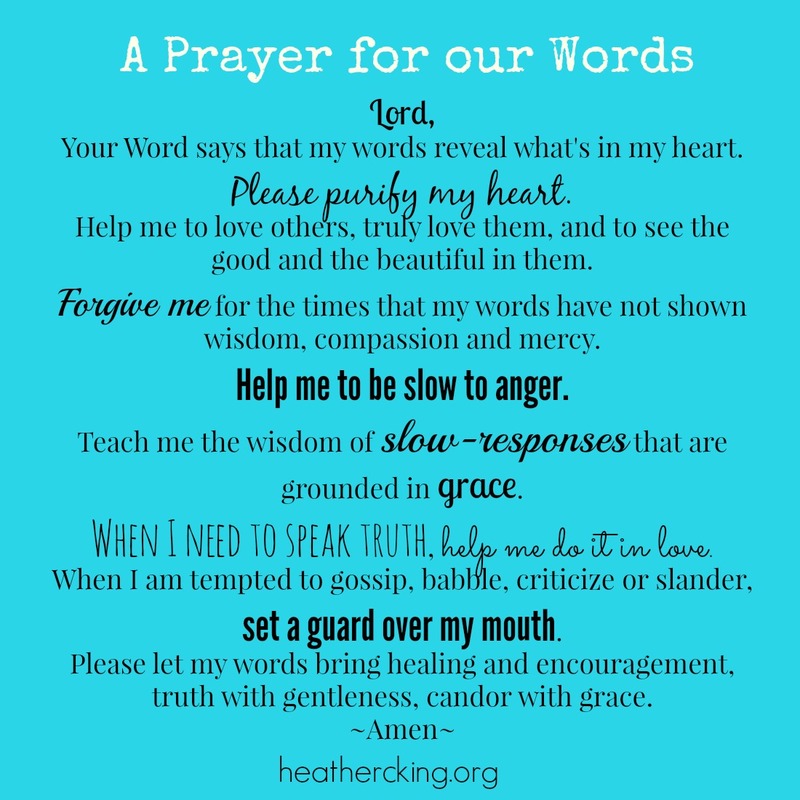 Like the nun who could only speak two words a year or like me who had 30 minutes to talk in a 24-hour day, we could prioritize and speak only what is necessary, true, and God-honoring. But I’m not always so careful. I sometimes forget that my voice is a precious gift and that my words have impact. It’s too easy just to babble off whatever pops into my head sans filter. The real issue here isn’t just speaking without thinking. It’s that ultimately, “out of the abundance of the heart his mouth speaks” (Luke 6:45b ESV). Essentially, at the end of the day if we’ve used most of our words to gossip—then we’re a gossip. And if we’ve spent most of our day complaining—then we’re a complainer. If our conversation has mostly been about criticizing other people—then we’re negative. If we’ve monopolized conversations with our own opinions and thoughts—then we’re selfish and self-focused. The words we toss about with little thought and no constraint are peeling back the covers of our heart and showing what’s really in there. And sometimes it’s ugly. That means we don’t just need to filter our words; we need God to do some heart changing, too. This isn’t advocacy for fake living, pasting cardboard smiles onto our faces and pretending everything is fine when it’s not. Even with God, we can speak with honesty. Job, steeped in tragedy, said, “Therefore I will not keep silent; I will speak out in the anguish of my spirit, I will complain in the bitterness of my soul” (Job 7:11). David, Asaph and other Psalmists clearly felt freedom to express hurt and anger to God. Yet, we can survey the overall tone and content of our daily speech and discover the tone and content of our heart. Then, we can let God change us from the inside out. If you could only talk for 30 minutes today, what would you use that time to say?